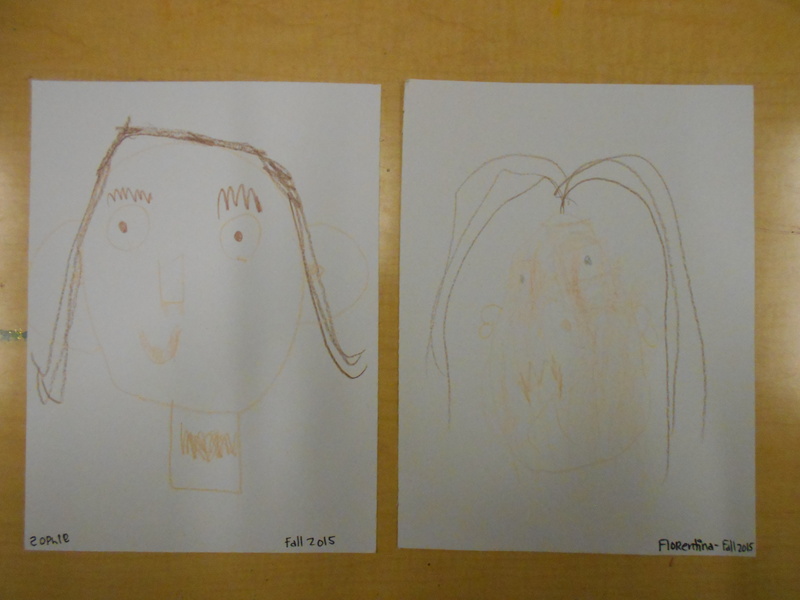 Portrait | Pre-K Art Stars! 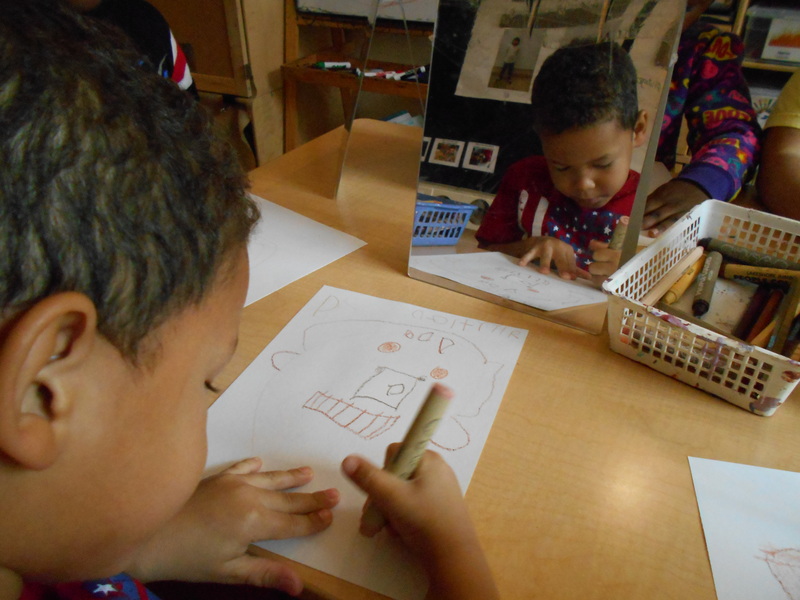 It’s one of my favorite times of year in the Pre-K Studio… self portrait week! Friends in Pre-K work on a self portrait for their portfolio at the beginning and the end of each school year. 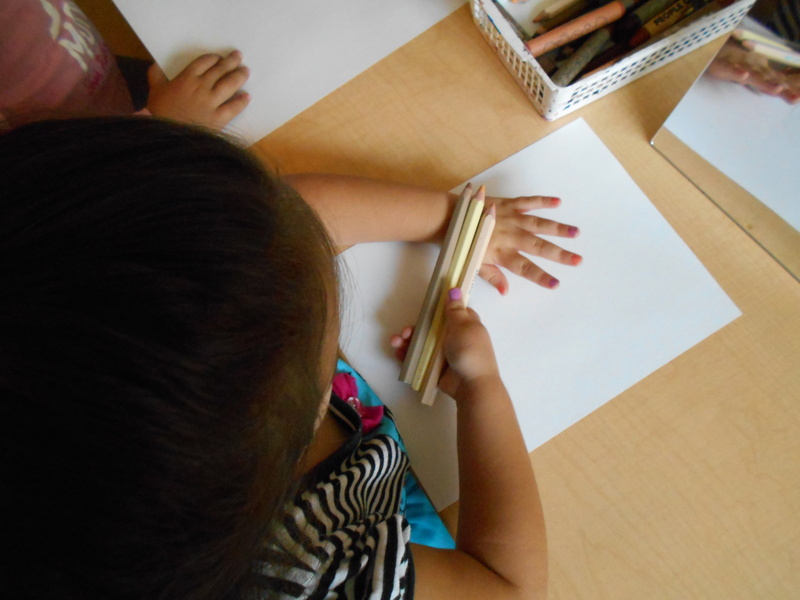 It’s great to see how much their observations and skills change over the course of the year, and for children that are in Pre-K for two years, over the span of those years. 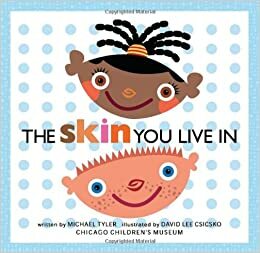 We began by reading The Colors of Us by Karen Katz and talked a little about different shades of skin, eyes, hair, etc. Ra’Maya: I’m cocoa brown! Yummy! Rayyan: I look so nice like yummy chocolate brown. Mae: Eyebrows are skittery skattery across your face. Zavier: You don’t have to draw your legs because you don’t see them in the mirror. I can only see my shirt, not my pants. Dai’Jah: I have to try to draw my bows! Andres: Camels have eyelashes, too. William: Eyebrows keep the sweat from getting in your eyes and the hair in your nose keeps sand from getting up there. It also stops wood chips from getting up there. It tangles it up and gets it out! Adrian: You forgot to draw earwax in your ear! William: I look like a flying potato! Carlos: Giraffes have eyelashes to keep mosquitos out of their eyes. They have ears like half circles, too! It’s that time of the year when we begin to get things ready for the end of the year… and for me that means, self portraits all week long! 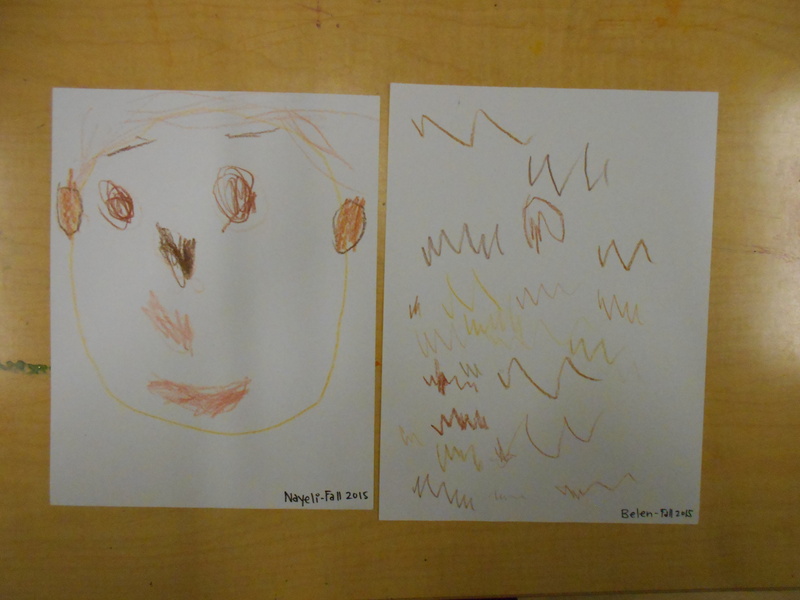 I love working on self portraits with children because it’s always so exciting to see the amount of growth from fall to spring… and for Pre-K 4’s, they will have 4 portraits to compare! Michael: You look in the mirror to see what you look like, what your hair looks like, what your shirt looks like, what everything on you looks like. Logan: I did awesome… it looks like me! Phoenix: No earrings… just ears. Noah: Don’t forget the two boogie things under the nose. My skin looks like syrup. This is fun! Cole: My head is like, tan? Darian: I’m not drawing hair because I got a haircut. Ebbisa: I look like a young man. I look fancy! Alexia: I only have a dimple on one side. Mouhammadou: I have two holes in my nose. Quentin: I think the top of my hand is like chocolate brown, and the under is like cereal. 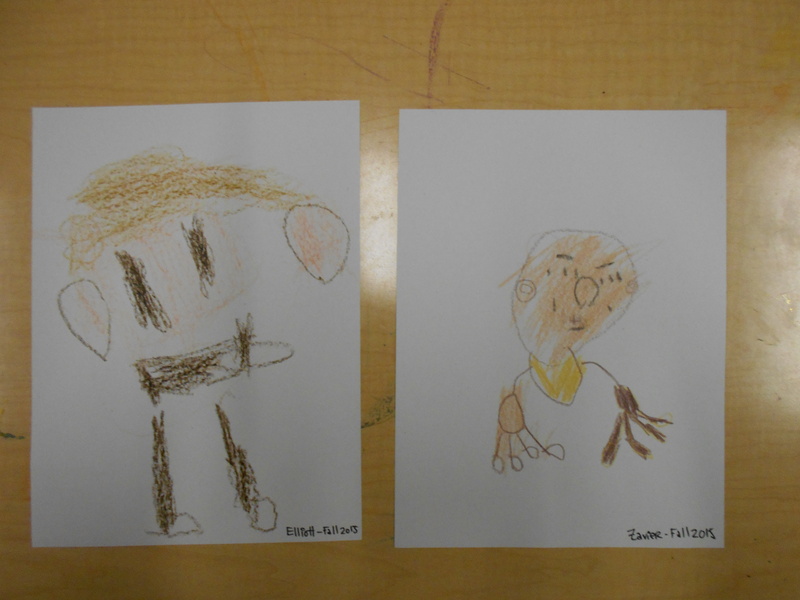 And here are some of our spring self portraits…! Yesterday was an incredibly exciting day in the Studio as we began learning about photography! As some of you may know, I was an education and photography major in college. I have always wondered how/when/if I could incorporate my love of photography into the Studio and finally decided to give it a try! I had a feeling they would enjoy it… but I wasn’t necessarily expecting them to love it as much as they did! We began by looking at old negatives on the light tables. I went through my archived work and found all different sized (35mm, medium format and 4×5) negatives and brought them in. I selected a wide array of photographs… portraits, still lives, landscapes, etc. 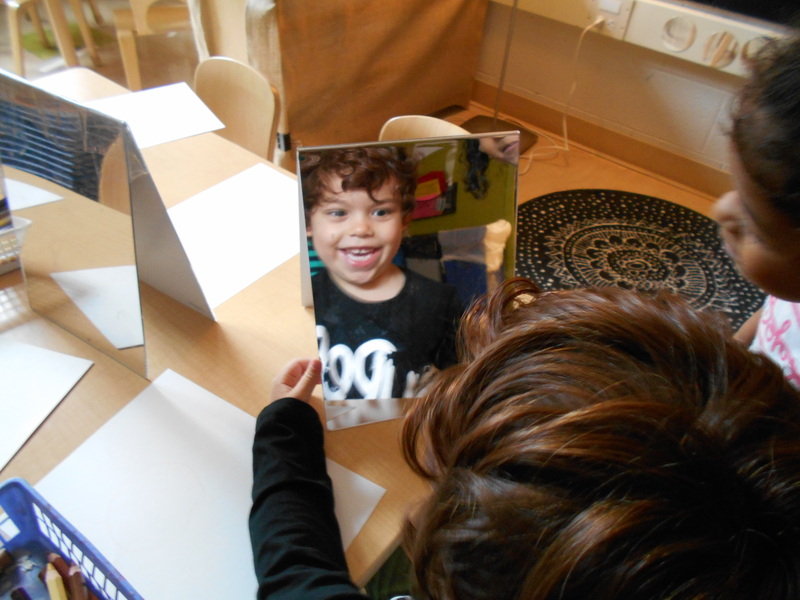 Children loved looking at the negatives and several groups decided to act out stories based on the way they were arranged on the light table. Wallace: I see a man with no face… they’re pictures! Georgi: I see cupcakes. We can make it into a story… it tells different parts. Phoenix: This looks like a library. Georgi: The elements of harmony… it’s like loyalty, kindness and My Little Pony. Jasper: We made the pictures in a row. I see they are pictures because they look like a camera took them. I see a person, a kitchen and another person. I found two gates. Darian: Are they food? You can’t see them when they are on the ground but you can see it on the light table. Minna: I put it back on… it’s something… it’s a monkey? Oh no, it’s a person! Next, friends gathered around the table as I passed out digital cameras that we were borrowing from the library! Children were beyond thrilled that they were going to get to take photos with “adult cameras.” We came up with some group rules about using the cameras safely and appropriately. Next, we had a quick demo lesson about turning the cameras on and off, taking a photo and seeing the photos you’ve already taken. Once children felt comfortable, they began taking photos of themselves, each other and objects in the Studio and hallway. Yesterday I posted some of the children’s photography… here are some moments that I captured while they were exploring! Today in the Studio, Thursday groups began exploring photography! Here are some of the photographs that the children took today… Stay tuned for a more detailed post of the day, from my perspective. 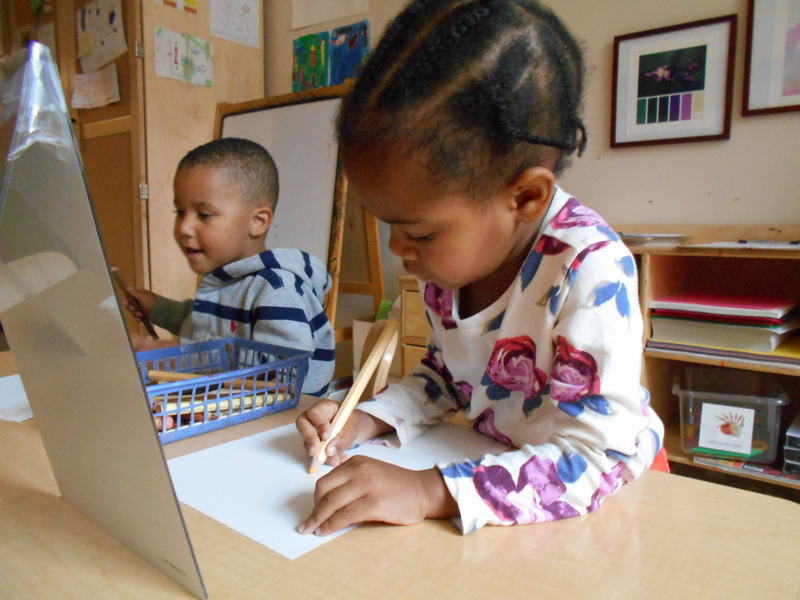 At CCPCS, Pre-K classrooms are mixed age (3-5 years old). Children remain in the same classroom for two years before moving up to Kindergarten. It has been exciting to see our Pre-K 3’s from last year transition into a leadership role as a Pre-K 4 this school year. 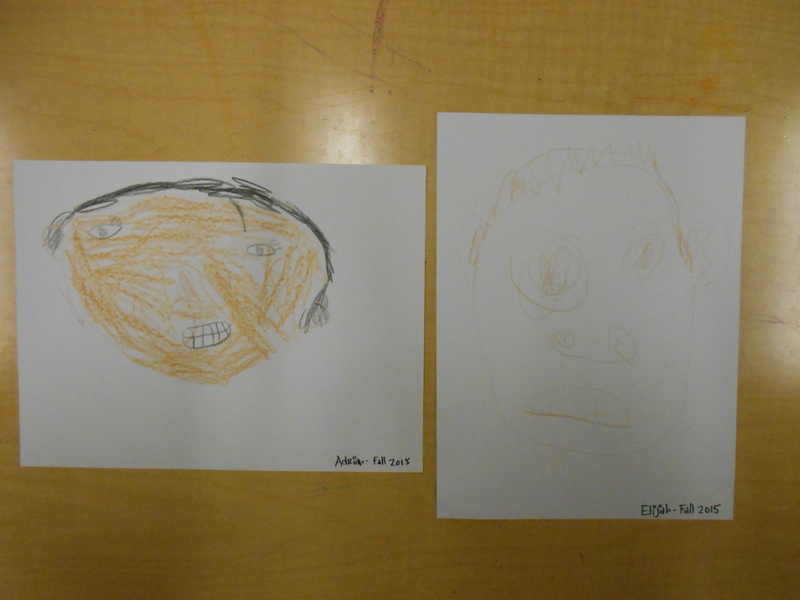 One part that has been particularly interesting for me to see is the progress they have made with their self portraits. 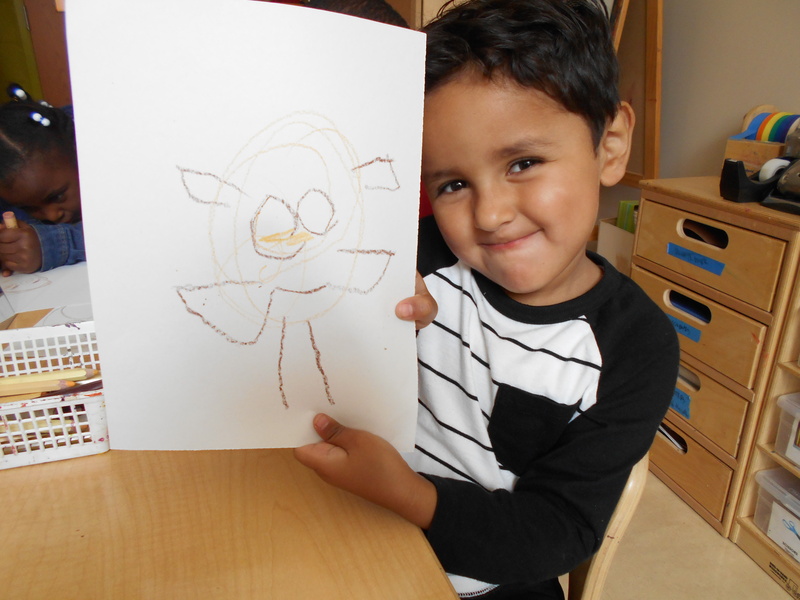 Self portraits are a key part of Pre-K portfolios. Children add to portfolios throughout the year and share them with their families at their final conference of the school year. 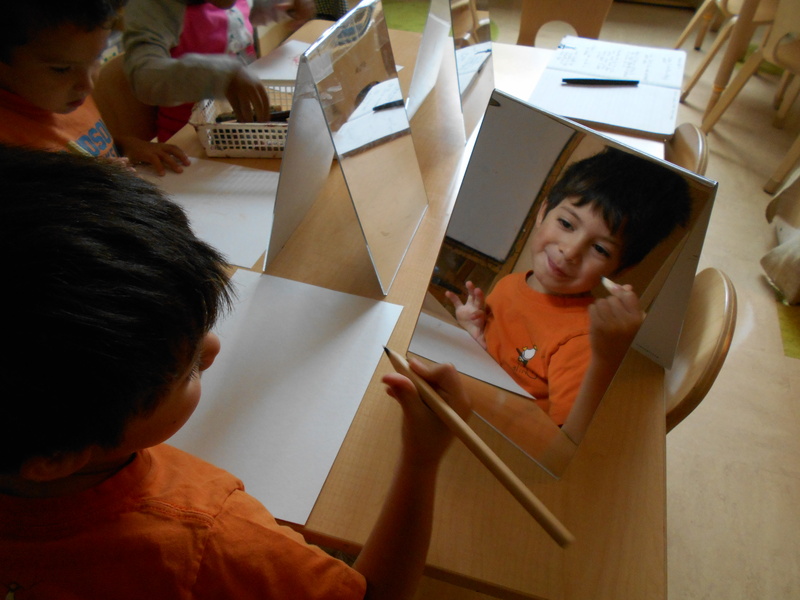 During the first few weeks of school, children observe their reflections in a mirror and draw what they see. It’s exciting to compare their portraits at the end of the year with those from the beginning, and to revisit work from the previous year. Above are Darian’s self portraits, beginning with his work from Fall 2012, followed by Spring 2013 and finally, his most recent self portrait from Fall 2013! He was just as proud of his growth as I was. 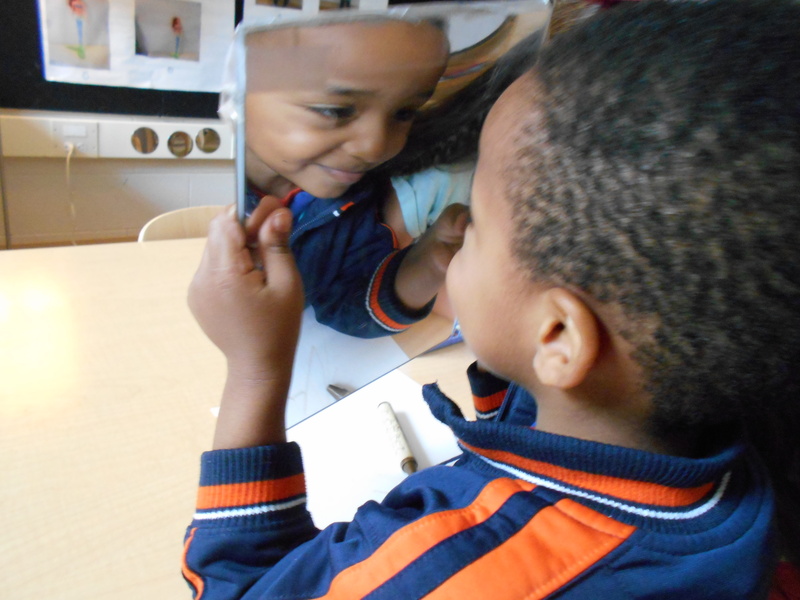 As we are learning about our new space, we are also learning more about ourselves! We began by reading The Colors of Us by Karen Katz and sharing about what makes us unique and special. 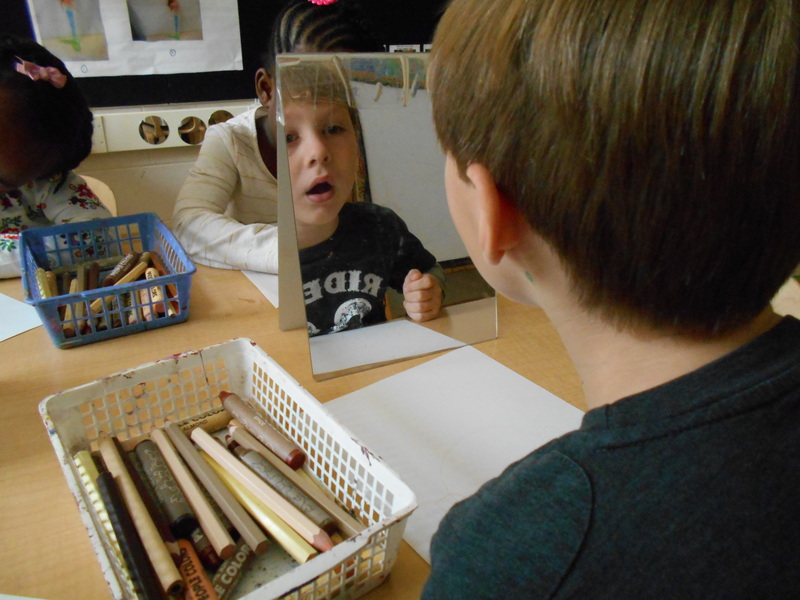 Next, children had fun observing themselves in the mirror and began their self- portraits with colored pencils and crayons. 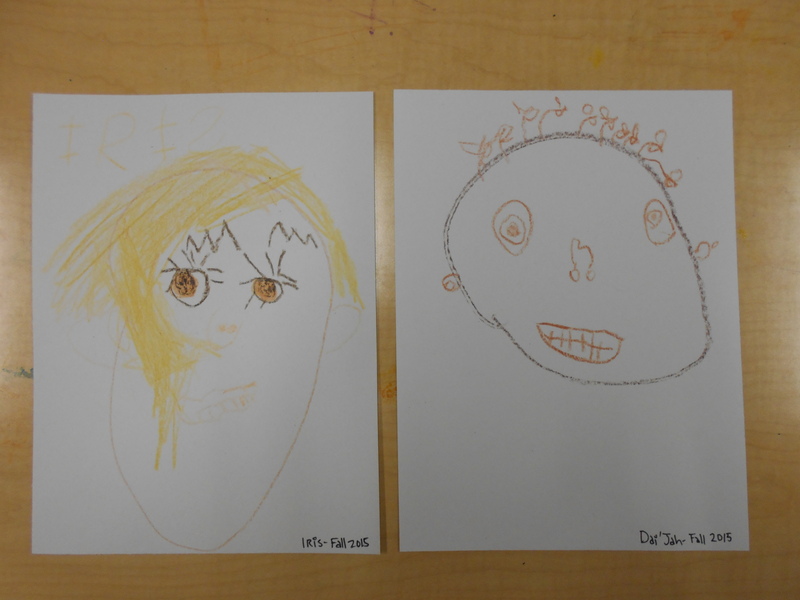 These self-portraits will be part of Pre-K portfolios that we will continue to work on over the course of the year!